A same day payday loan is borrowed money made available within one business day of application. The loan is expected to be repaid within one or two weeks, depending on when borrower's next paycheck is due. The money is borrowed at a higher interest rate than a typical long term loan. These types of loans can assist individuals who need cash quickly and do not have access to credit or savings. 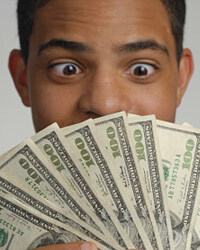 A same day payday loan can be acquired online and at some live locations by applying and waiting for approval. Since the lenders are not necessarily regulated banks, a high credit score is not always required. Some sort of credit history is often required, however, to speed approval. You may need to provide your social security number, driver's license, and two recent paystubs along with your completed application. If you are applying in person, you may be able to receive the cash immediately. If you are applying online, you will need to provide your bank account information so that the money can be transferred electronically.